Yesterday, after the tea, the scones, and the Staigue Fort, we continued around our peninsula. 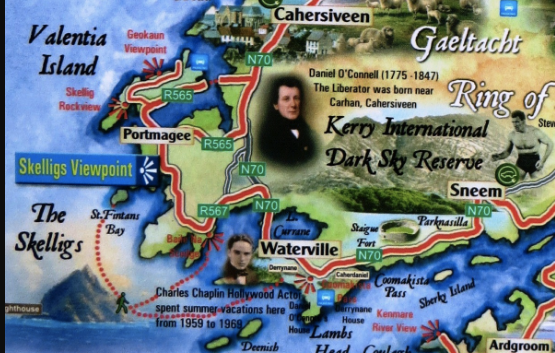 We started on the lower right near Sneem, then around to Staigue Fort, Derrynane and Caherdaniel, Waterville, Portmagee, "Skelligs Viewpoint," and then finished at Cahersiveen. We just wanted to get to know the neighborhood. As we neared Portmagee, and the turn off to Valentia island, we were taken in by the signs advertising The Most Spectacular Kerry Cliffs. We decided to give them a try, as they seem to be an unintentional satire of Co. Clare's Cliffs of Moher. 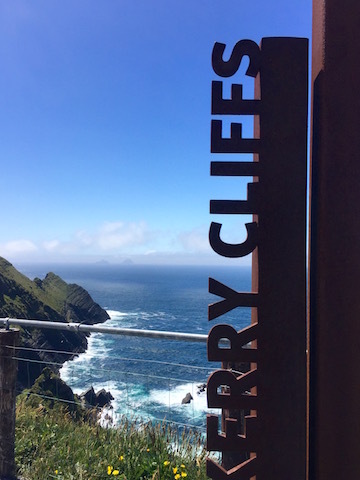 As we entered Portmagee, as we negotiated through the village and its outdoor restaurants jammed with anxious Americans trying to get a boat to Skellig Michael, at every turn, another sign post: The Most Spectacular Kerry Cliffs. The road narrowed, silage tractors multiplied, excitement grew. 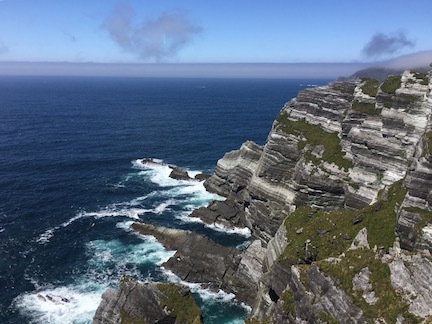 The Most Spectacular Kerry Cliffs! We must be nearly there by now? 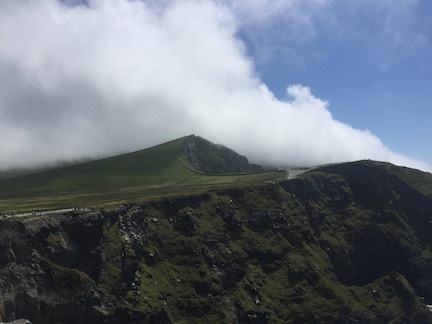 The road is impassible to tour busses, so it may not become as beloved as the Cliffs of Moher. They are, as promised. Photographs do not convey the raw edge of the continent, the blue green of the waves, the birds falling and falling into the wind. In the misty distance, we could see the Skelligs, looking just like magical islands look. The view inland, yet another impossibly beautiful coastal valley. There's no sense in trying to write about it. I could compare this place perhaps with Big Sur, but her older and wilder sister. The overt attempts to attract the tours is a little cheesy, but it worked for us, and I am grateful. I am grateful for everything.